Regular readers of this blog would know that I find research very interesting. If I come across an interesting research report that I believe could be useful to Elementum Money readers, I ensure I put it out here which is what led to my post about the Indian Retail Investor research as well as the piece on Women Give 2018. 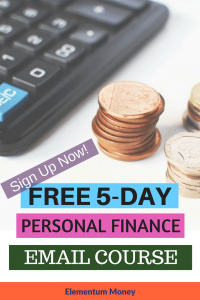 The research that I am talking about today is particularly of interest on a Personal Finance blog. 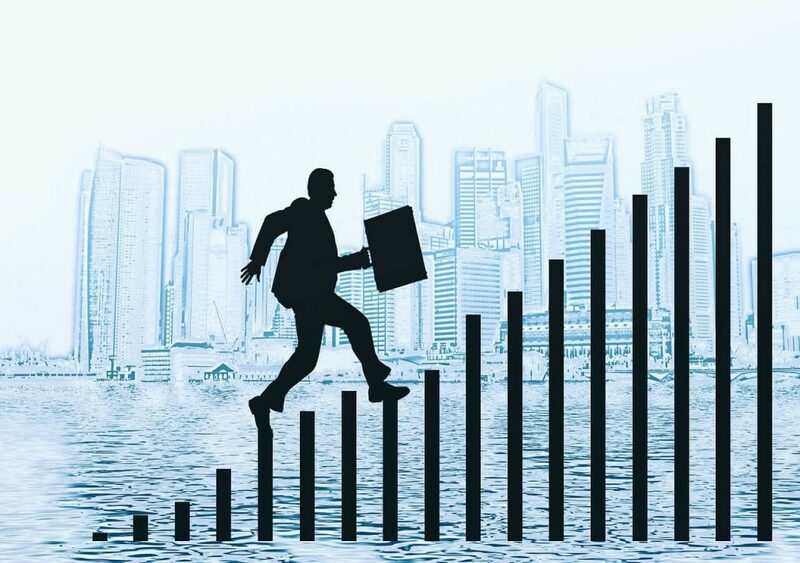 Commissioned by Standard Chartered Bank, the fourth installment of Climbing the Prosperity Ladder was a study that gave me a lot of interesting numbers to mull over. What is the study all about? The study defines “upward social mobility” as the possibility for people to carve out a better lifestyle for themselves and their children than their parents were able to do. The probability of this happening is higher in economies on the growth trajectory like India and the other countries covered in the study than advanced Western economies which are seeing sluggish growth. After all, when the overall economy has a growth spurt is when it’s citizens will see the impact. This study defines Emerging Affluent respondents through certain criteria (that I will detail out in the next section) and talked to them to infer on the aspects of social mobility, financial proficiency and digital savviness. Don’t worry about these scary looking words. Once you discover what they actually mean by it, which is far simpler than the words suggest, you will realise just how wonderful this study is. 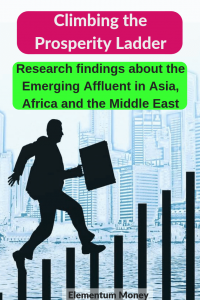 The fourth instalment of “Climbing the Prosperity Ladder” is comprised of responses taken through online or Face-to-Face interviews from 11000 respondents across 11 countries in Asia, Africa and the Middle East. The countries comprise of China, Hong Kong, India, Indonesia, Kenya, Malaysia, Nigeria, Pakistan, Singapore, South Korea and the UAE. There were two main parameters used to measure the social mobility of the emerging affluent respondents. Firstly, comparison to their parents on the parameters of the level of education, employment status and home ownership. Secondly, the respondents’ earnings and the pace at which it had grown in the last five years. Below is a table summarising the minimum income that was used as a parameter for someone being termed Emerging Affluent for this study. The study looks at the gap between the socially mobile and their parents at different parameters – earnings progression (28% have had a raise of more than 50% in the last 5 years), career stage (75% are in management positions or running their own business compared to 52% of their fathers and 34% of their mothers), property ownership (88% own their home compared to 78% of their parents) and higher education (85% went to university compared to 50% of their fathers and 41% of their mothers). 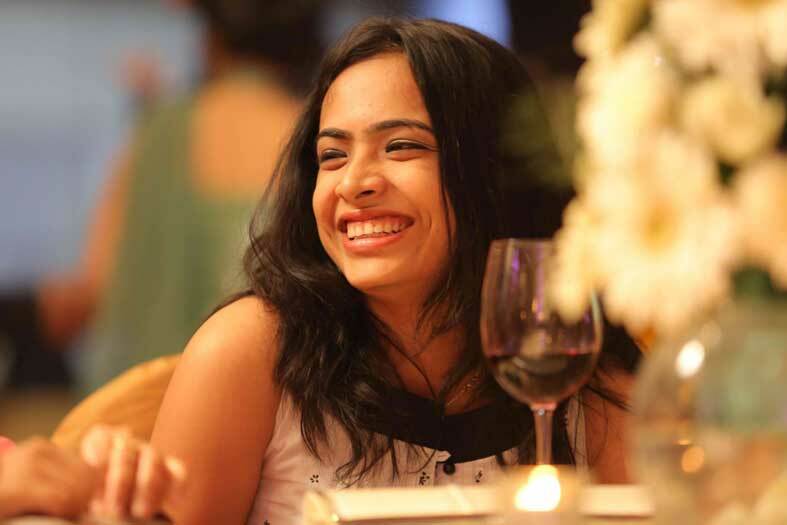 At each and every parameter, this generation of socially mobile shows a significant gap as compared to their parents. From personal experience, at least from an Indian standpoint, I think the reasons are quite obvious. The opportunities that this generation has are something that much fewer of our parents generations did. While there is evidence to suggest income inequality is growing, when I look around, I also believe income democratisation is growing too. Today, in the emerging economies, there are enough opportunities to be grabbed which more than a few people are doing. This is what has resulted in such a varied gap. 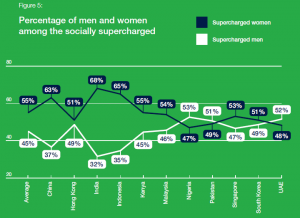 Women are leading the socially mobile in most of the participating markets. Source. The difference for women as compared to their mothers is even more stark. 84% completed their higher education compared to 44% of their mothers. A third of the emerging affluent respondents confirmed their mothers were not working whereas only 2% among this group were homemakers. Again, I am not particularly surprised at the finding, though seeing it as a result of this research sure made me happier. I believe as an economy grows, the beliefs and the conventions evolve along with it. A generation ago, working women had barely any support and they were pretty much looked down upon. It was often even a condition for marriage that the woman may not work once she is married. Today though, a lot of women cherish and guard their right to financial independence. Their parents who have weathered the changing times and grown along with it have also ensured a perfect foundation through education which they themselves may not have been privileged enough to have access to. While more than half of the emerging affluent believed that growing personal wealth over time is an important sign of achievement, considering everyone’s definition of wealth varies different countries seemed to value one thing more over the other. For Nigeria, leaving a legacy to your children gained immense importance (24% compared to the overall average of 16%) whereas 38% of respondents in Indonesia valued individual enterprise more. Hong Kong still placed far more importance to property ownership with 46% respondents describing home ownership as a symbol of success which goes to give a glimpse as to the skyrocketing real estate prices in that market. 24% of the Chinese gave more of the due to luxury products as compared to the overall average of 16%. Just goes to show that the demand for luxury goods in China is not slowing down any time soon. This was hands down the most interesting part of the study for me. Investing is important and the fact that the emerging affluent are thinking about it is an encouraging sign. 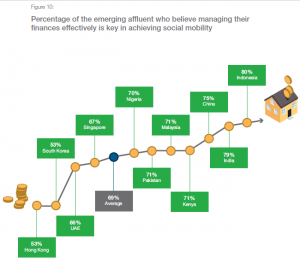 As many as 80% of respondents in Indonesia and 79% in India believe good financial management is a necessity to continue with going up the prosperity ladder. 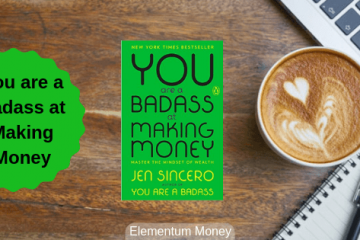 The reason for Elementum Money’s existence got a boost when I read that 42% of the emerging affluent believe that lack of financial knowledge is holding them back. Not only has the financial services landscape grown more complex in recent years but with some misselling experiences, people end up realizing the need for financial literacy. Come to think of it, as compared to the American personal finance blogosphere, there are extremely few that cover the emerging markets. A lot of them are out there to make a quick buck by doing sponsored posts when the opportunity is there for the taking. However, very few of them show a long sustained practice of putting out content driving towards financial literacy. Another interesting data point in the study for me was the fact that almost 80% of the emerging affluent use only one investment product! This statement is critical in terms of the kind of financial products that the respondents are quoted as using to achieve their financial goals – 49% depended on Savings Accounts, 29% used time deposits or fixed deposits whereas about 23% were fixated on real estate. The fact remains that stocks and bonds are still an unknown to most of them even though those two asset classes could be the real wealth generators over a long time! Simultaneously, 52% believe they are far from achieving their financial goals and half of that number describe themselves as very far away. The need for good quality financial advice and education couldn’t be more clear. Probably the reason why Investment Counsellors are now a prized breed for Indian banks. Not surprisingly, digital access to their financial lives is considered as a huge game changer for this set. They feel more in control of their finances (65%) with Indians leading the way by having 80% of the respondents feel this way. While bank apps are definitely used, third-party apps are not a no-no either. Clearly, the sense of risk that the previous generation felt with doing things online, is not shared here.